So this is it: the recipe you’ve been waiting for. 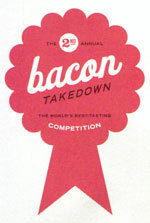 Yesterday we posted about the Chicago Bacon Takedown—this is what we made and won the Judges’ Choice for 2nd Place with. It is pretty weird, we know, but not only will you enjoy eating this but you will be basking in sweet, bacon-y glory when you take it with you to a party this fall. I promise. I even have a vegetarian friend who wants to eat bacon now because of it. It is official: You are reading an award winning blog. (Or, uh, our recipe won the award, but still!) More so, the award is related to a food item we all have a love-hate relationship with because we can never get enough of its salty, fatty, crispy deliciousness. After we wrote about baking bacon last week, Kendall happened upon an article requesting more competitors in the Chicago Bacon Takedown, a competition of amateur cooks to create the BEST bacon dish for 250 people to sample at Lincoln Hall. After showing the article to me, we both accidentally shrugged the idea off. The next day, with less than twenty-four hours before the Takedown, the prospect of receiving 15 pounds of no-strings-attached bacon to cook with sounded like a great idea. We e-mailed the guy coordinating the event, promptly started brainstorming while swearing not to get our hopes up and… well, waited.